Bauman says no Republican who has received the questionnaire has bothered to return it, so when it comes to candidates who are working to stop Social Security from being privatized and prevent Medicare from being turned into a voucher system, there is only one real party for Senior Votes Count to choose from this year. Bowzer also emphasized that local issues that matter to seniors, including homestead tax credits and property taxes, and can be quite significant, particularly in gubernatorial races. Since seniors are more likely to be homeowners, these issues very much matter to them, even when they don’t receive as much attention in campaign ads as Social Security and Medicare. Bauman has been campaigning hard on behalf of Democrats among seniors. He’s arguing that despite Republican attempts to demonize Obamacare, it won’t work this time. Now that the program is actually taking effect, seniors can evaluate how it works for them, and that by and large it has been working better than they expected. While last year’s rollout was problematic, things have since stabilized. The massive cuts to Medicare the GOP has been warning about never occurred, and voters are realizing that. The Republicans have responded by continuing to rant about Obamacare and falsely accusing Democrats of trying to help undocumented immigrants get on Social Security. Senior Votes Count’s events have been drawing good numbers, and have been generating headlines for Democratic candidates. “Bowzer” knows his celebrity status among older voters is a major help, although he emphasizes these events are about substance even if he throws a bit of music in. It’s a good bet that seniors will still back the GOP in the next election, but if groups like Senior Votes Count can move the needle even a few points, it can make all the difference in plenty of tight races. There are certainly plenty of tight races to choose from. Democrats are continuing to work to expand the electorate and appeal to left-leaning younger voters who didn’t show up in 2010. However, it’s clear that senior voters remain a coveted demographic. If Team Blue wants to hold the Senate, it can’t afford to concede older voters. Both parties are aiming much of their messaging at seniors: The 2014 election may come down to whether Democrats can successfully argue that the Republicans aren’t looking out for seniors, or if the Republicans’ anti-Obamacare campaign works again. 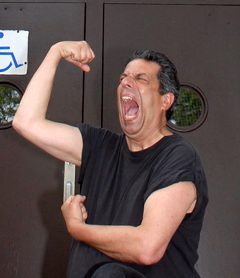 Not the usual approach for political advocacy, certainly, but Mr. Bauman is better known as Bowzer, the T-shirt-wearing front man for the rock ‘n’ roll group Sha Na Na. Mr. Bauman, 67, was on a conference call arranged by organizations denouncing a proposed measure in Arkansas that opponents say would cut benefits for older Americans. In the 45 years since Sha Na Na performed at Woodstock and later crooned in leather jackets on their self-titled TV show, Mr. Bauman has been employing Bowzer to back Democrats in congressional races, help promote legislation and beat back challenges to Social Security. He almost always sings. “He’s very popular, especially among folks 50 and older who grew up watching his show,” said Eric Bauman, his nephew and vice chairman of the California Democratic Party. Bowzer’s appeal to a coveted demographic in American politics has not gone unnoticed. In the past month, he has stumped for candidates for Congress and for governor in New Jersey, Pennsylvania and Michigan. He also worked on the passage of “truth in music” legislation to protect artists from impostors and predatory management, and he helped found Senior Votes Count!, a group that aims to advance the rights of older Americans. Evidently Mr. Bauman is determined to make sure that social programs, like rock ‘n’ roll, are here to stay. Kevin Strouse, a Democrat running for Congress in Bucks County, held a news conference at the Warminster VFW Tuesday morning promising to protect programs like Social Security and Medicare if elected. Speaking to the crowd of about a dozen, he said he understands how important the programs are to seniors, though he later conceded he didn’t know how many constituents in the district benefit from them. But before Strouse could take the microphone, he and the crowd listened to an impassioned 15-minute political lecture from Jon “Bowzer” Bauman, a singer from the 1970’s doo-wop band Sha Na Na. Bauman, who also runs Senior Votes Count, a political organization that backs mostly Democratic candidates, kicked off his speech by displaying his signature pose: flexing and tilting his head to the sky like a fire-breathing dragon. He then spoke at length about his opposition to privatizing Social Security, forcing seniors to purchase private medical insurance, and partisan-fueled redistricting, while sprinkling in vignettes about his show business career. With slicked-back hair and a booming voice, Bauman endorsed Strouse over Republican incumbent Mike Fitzpatrick, saying Strouse’s priorities were in line with his organization’s. “You’ve got a great candidate,” Bauman said, before singing Strouse’s name to introduce him. In a brief interview after the event, Strouse said he was not sure how many residents in Pennsylvania’s Eighth District received Social Security or were on Medicare. His staff later provided figures: more than 140,000 people in the district are social security recipients, and about 122,000 Bucks County residents receive coverage through Medicare. Bauman, who also recently campaigned for Democratic Gubernatorial candidate Tom Wolf, closed the event by offering glossy photos and autographs to guests. On election day, he told the crowd, Strouse “is going to be doing this!” Again, he displayed his patented flex pose. Reprinted from FOX 40 WICZ. If you’re a fan of doo wop then you probably know all about the popular seventies band Sha Na Na. Tonight the band’s infamous “Bowzer” was in Owego to show his support for Congressional Candidate Martha Robertson. As the candidate for District 23, Robertson is fighting for the rights of seniors in the Southern Tier. “Bowzer” spoke about the importance of senior benefits and of course played a little bit of music. In addition to advocating for senior rights Robertson plans to bring jobs back to the area if elected this fall.